Olentangy’s Jaden Konadu bounces to the outside during the first half of a Week 4 showdown against visiting Dublin Coffman. The two meet up again Friday, this time in Dublin for the first round of the Division I playoffs. 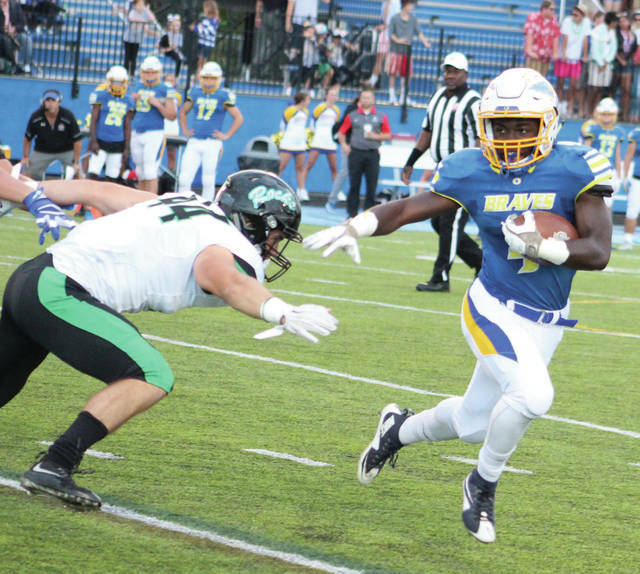 When the Olentangy football team hooked up with visiting Dublin Coffman in non-league action earlier this season, not many saw the Braves’ 31-14 win coming. The Shamrocks, who were eighth in the Division I state poll at the time, entered the game 3-0 after outscoring their first handful of opponents by a combined score of 132-0. The Braves, meanwhile, were fresh off a 31-7 loss at Reynoldsburg. None of that mattered, though, as Olentangy showed it can play with anyone when at its best. Ziyan Sears returned a fumble 48 yards for the go-ahead score with less than five minutes left in the third quarter as the Olentangy defense blanked Coffman in the second half. The Braves forced three turnovers in all and limited quarterback Marcus Ernst to just 128 yards passing. The Olentangy offense was boosted by Riley Bruening, who passed for 130 yards and two touchdowns while adding another on the ground. The two hook up again Friday, this time in Dublin for the first round of the Division I playoffs. The fourth-seeded Shamrocks (8-2), champions of the OCC-Central Division, have won five straight. The fifth-seeded Braves (7-3), meanwhile, enter on a two game winning streak. Olentangy coach Mark Solis said his team has only gotten better since the early-season showdown. “I like how we have improved as a team going into this game,” he said. “I think our schedule has prepared us for the playoffs. Four of the Braves’ 10 regular-season opponents — Coffman, Hilliard Darby, Olentangy Orange and Olentangy Liberty — are playoff teams. Olentangy is 2-2 against them, including a 45-24 win over Darby in the first week of the season and back-to-back losses to rivals Orange and Liberty by respective scores of 30-28 and 28-17 in weeks 7 and 8. The Shamrocks lost in Week 5, dropping a non-league showdown against Gahanna (another playoff team) 34-32, but haven’t lost since. Solis said keys to beating the Shamrocks for a second time will be doing more of what made the Braves successful the first time around. The offense, led by Bruening, has played pretty well all season, averaging right around 30 points and 400 yards of total offense per game. The senior QB has completed 137 of his 205 passes so far this season for 1,681 yards. He’s thrown 16 touchdown passes and just six picks. He’s also rushed for six scores and covered 651 yards on the ground. Caden Kaiser has been one of his top targets. The junior has 827 receiving yards and eigth touchdowns up to this point. Ali Iverson, meanwhile, has bouyed the ground game with 711 rushing yards and nine TDs. The defense, led by linemen Zach (five sacks, 17 tackles for loss and 53 total tackes) and Jacob Slade (54 tackls, 10 tackles for loss and two sacks) and linebacker Xavier Harrison (81 tackles, six tackles for loss and three sacks) will have to control the line of scrimmage as well, Solis said. Kickoff is set for 7:30 p.m. Friday at Coffman.